I first became involved with Old Hats a couple of years ago at Signature Theatre in New York. 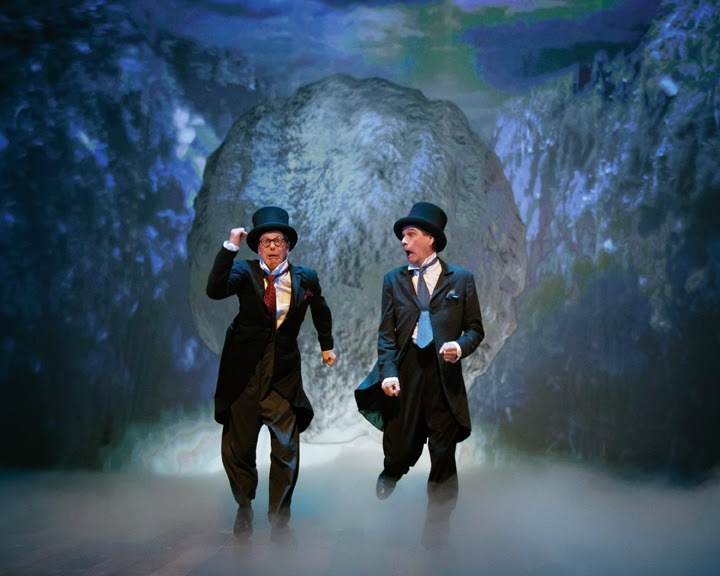 Bill Irwin and David Shiner had started developing ideas for a new project that would be a follow up to their wildly successful Fool Moon. There was no show yet, really—no director, no title—but they had a lot of ideas. Many of these ideas involved the imaginative use of projections and video. I joined Broadway projection design legend Wendall K. Harrington in taking on this challenge and began collaborating with the clowns in a series of workshop rehearsals at Signature. of Old Hats at A.C.T. 's Geary Theater. 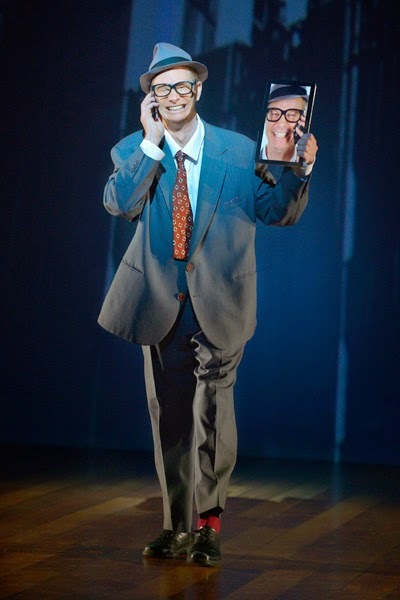 My work focused primarily on a new solo piece Bill was creating, called “Mr. Business.” He had an exciting idea for a new technology-obsessed character and his misbehaving tablet computer. Bill envisioned a complicated struggle between a man and his gadgets in which the tablet takes on a life of its own. We began developing ideas in a rehearsal room together, trying out gags and experimenting with surprising ways for Bill to interact with the tablet. At the same time, I was working behind the scenes to figure out the technology necessary to support the performance. As far as I’ve been able to tell, no one had ever attempted anything like what we were doing, and this led to many unique challenges. To run the tablet computer for the New York production I created a sort of Frankenstein’s monster of computers, wireless routers, off-the-shelf software, and an iPad, all connected together to bring the tablet to life. The completed system allowed us to wirelessly send video to the tablet in Bill’s hand as he performed. When it worked correctly, it was as if the image on the tablet interacted with and responded to Bill just as a live actor might. Unfortunately the system was not entirely reliable, and on some nights Bill’s electronic companion would misbehave. It was as though the other actor in the scene would sometimes forget his lines and Bill would have to improvise to keep the scene going. Bill and I shared many a laugh over the way life was imitating art; our efforts to get the technology behind the scenes to work properly mirrored the struggles of Bill’s character to control his tablet. Thankfully returning to the show for a second time at A.C.T. has given us an opportunity to fix some of the bugs we encountered in New York. For this production we’re working on a new and improved version: “Mr. Business 2.0.” Before rehearsals even began, we shot all new video for the tablet on stage at the Geary, improving on our original ideas—going for new laughs and expanding the story. We also brought in a local programmer, Dave Orton, to work with us in creating a brand new piece of software to run the tablet. This new app makes it possible to run “Mr. Business” with a single computer and Android tablet—no more Frankenstein’s monster! Our hope is that this version will be much more reliable. As with all of Bill and David’s work, the comedy in “Mr. Business” is inspired by the kind of human struggles we all encounter in our day-to-day life. While technology may continue to seduce us with its promise of making things easier, it often seems that for every problem solved another is created. In Old Hats, Mr. Business leaves the stage having triumphantly conquered his gadget dependency. Having faced and overcome our own technological demons, we’re thrilled to share “Mr. Business” with A.C.T. audiences! Performances of Old Hats run through October 12! For tickets and information visit act-sf.org/hats.